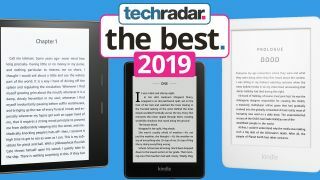 Best Kindle 2019: which Amazon ereader should you buy? If you've landed here, it's likely you're after an ereader. In 2019, the rule is that the best ereaders are, generally, devices made by Amazon. There are a few devices worth getting, such as the Kobo Forma, but more often than not you'll likely want to opt for Amazon's Kindle range. We've used each and every recent Kindle model extensively for our reviews, and below we've put together the ultimate guide so you can find out what Amazon branded ereader is for you. Unlike many other TechRadar buying guides, we've put together this list in price order rather than specifically ranking them. A lot of what you'll want here comes down to how much you're willing to spend. That's why you won't see these products ranked by number, and instead this is a culmination of the best products so you can judge for yourself exactly what you'll need. The Amazon Kindle (2016) is the most basic and affordable ereader the company sells, and it's worth knowing that this ereader isn't long for this world. This is the older model that has since been replaced by the all-new Kindle, but Amazon is still selling it for the timebeing. That's likely so the company can work through stock, and it has discounted it around the world to around £49.99/$69.99 (about AU$90) at the time of writing. You'll learn all about the latest Amazon Kindle model in the next section, but the core upgrade with the newer model is it has a backlit display. Almost everything is similar on this older model, so if you don't need that backlit screen and you're looking to spend less it may be worthwhile getting this while it's affordable. It features a long lasting battery and plenty of space for all your digitial tomes, plus an intuitive interface, that makes navigating your books a breeze. Just be warned, you won't be able to buy this model for long. Why should I buy it? Because you want a bargain and can live without the backlight and sharper screen found on the newest Kindle. Then we come to the all-new Amazon Kindle, which is remarkably similar to the device you'll find above but it comes with a variety of extra features that you may find worthwhile. Number one is the fact you can read in the dark with the latest version of the Kindle. It comes with a backlight, which is a first for the affordable ereader range from the retailer, and for anyone who has ever been frustrated they can't read in bed this is a big feature. The design is slightly different, but it's still a functional look that you'll likely want to encase in well... a case. It's comfortable to hold in the hand, and the battery life should last for around a month of half an hour of reading each day. The thing to note here is that the display isn't perfect. The resolution isn't as good as the devices coming up on this list. When you're reading books this can be difficult to notice, but we particularly notice it when reading magazines or comic books. That's a minor thing for most people though, and it's well worth picking it up if you're after an affordable ereader that does the basics really well. Why should I buy it? Because you don't want to spend lots on an ereader, but you do need a backlight. Amazon updated the Kindle Paperwhite back in 2018 to add several features from the Voyage and Oasis lines, including IPX8-rated waterproofing and support for Audible audiobooks. The screen is still fantastic with a beautiful 6-inch HD display with 300ppi pixel density and 8GB of storage, meaning you can keep thousands of books on one device. The Kindle Paperwhite is almost the closest you can get to real paper while getting all the benefits of an ereader. You have access to Amazon's huge library of books and you can even use the Kindle Unlimited rental service on the Paperwhite. There's a built-in light and you're not going to get any screen glare when reading it in bright sunlight. The battery isn't as good as the last version as it only lasts between four and six weeks, but that said it's still a very good amount of time to get reading your ebooks. Why should I buy it? If you're looking for one of the best screen experiences on an ereader and you want to be able to read in bright sunlight, the Amazon Kindle Paperwhite is your choice. The Amazon Kindle Oasis is the most expensive and advanced traditional Kindle you can buy today. At over three times the price of the standard Kindle, you’re dropping a lot of cash, but it’s worth it – the Oasis is one of the best Kindles you can buy, especially if you’re looking for the traditional experience. If you're looking for the most comfortable ereader experience you can ever have this is the best one for you. It has a brand new design that's now made of aluminium and is also waterproof, so you can read in the bath or next to the pool while you're on holiday. The Kindle Oasis is thinner on one side, which makes it even easier to hold in one hand. There's a vibrant display with 300 pixels per inch and a fantastic backlight that makes it the brightest Kindle yet. The battery is all inside the latest Kindle Oasis (there's no charging case like on the 2016 version) so you'll get six weeks standby life and we found it lasted a whole week with a few hours reading a day. Plus you can now listen to audiobooks with Audible too, but you'll need to have a Bluetooth speaker or pair of headphones to hook up as there's no speaker or 3.5mm headphone jack. This will cost you quite a bit more than all the other ereaders on this list - but if this is the device you use every day to absorb your tomes, why not spend that little bit extra? Why should I buy it? If you want the very best ereader experience, the Kindle Oasis offers it. Need more functionality? Why not check out our best tablet and best iPad round-ups?